For most of you, this post is going to be nothing but a big fat, “duh” and certainly nothing revolutionary. For me, this was apparently nothing less than a miraculous connecting of ideas: There is far more to writing than writing itself—it begins with the breath and ends only once it has traveled through the whole of our body, mind and psyche, and reached the very tips of our fingers. There can be physical hindrances to our creativity any number of places along the way. 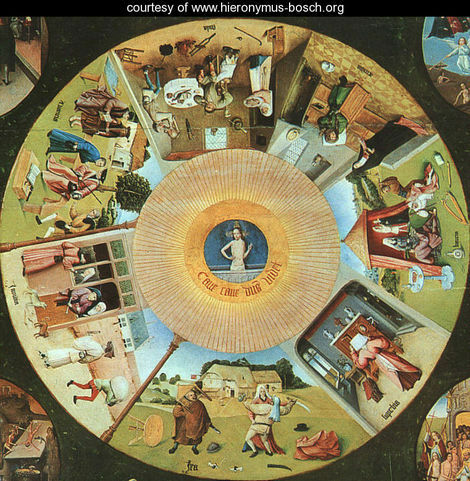 Hence, the seven deadly sins of writing: Lust, gluttony, greed, sloth, wrath, envy and my personal favorite, pride. How does this translate? Easily, and with peanut butter in most cases. Lust is expressed through our unchecked need for self gratification. Do we write to please others or merely the self? Do we write with The Story in mind or with what we hope it can bring us? A sincere lust for the self will translate into your fiction faster than you think and it will leave your prose flowery but lacking in the most elemental of ways, because it will appeal only to you. Greed, often related to monetary wealth, shows up in a number of ways for the writer. Aside from the obvious, greed can manifest in an uncontrollable need for fame and the spotlight—to the point where others are completely cut from the process. Spouses who provide support and friends who have given endless encouragement fall by the wayside in light of the author’s need for recognition. Sloth is the wasting away of God given talent. “I don’t feel like writing” or “I’m not inspired”; a basic lack of will to get beyond these things. “I could, but I won’t” for any number of reasons. Wrath, my second favorite. This blames everything on everyone but the writer. “I’m not published because the agent/publisher/reader can’t see how brilliant the story is”; when in fact, the market has little or nothing at all to do with your productivity as an author. Instead of merely stating an opinion once and being done with it, the sentiment gets carried again and again into blog posts and into fictional scenes where characters proclaim the author’s soapbox in ways that all but assure a lack of understanding on the reader’s part. Why? Because it’s not the sentiment of the characters; it belongs to the writer. It will feel out of place to everyone but the author who put it there. Envy, the green-eyed love child of wrath and greed. Sometimes it’s a coveting of something the writer never really wanted in the first place. If lust and gluttony have a strong enough hold, you’ll find yourself lusting after a whole host of things that really aren’t related to your craft at all; fame, fortune, recognition, awards…the list goes on and on. And Pride…”I don’t need help”, “I don’t need to improve” and “You don’t have anything valuable to say” can easily overtake a rational writer’s thinking. The reverse of this is just as damaging: A low self esteem can leave an author reeling after every comment or criticism and will force them to lean heavily on the thoughts and suggestions of others. The bottom line for any author is this: You’ve got to know yourself before you can know those who you create, that which you create. Just like an athlete knows their body well enough to know when the muscles aren’t working properly, when nutrition is lacking, so does an author need to know their mind and body well enough to know when something isn’t right with their story, character development or even just the mechanics of grammar and sentence structure. This means that there is more than a small connection between how we treat our bodies and how productive we are as writers. Poor health, emotional or physical, will carry through to your prose. Ever hit a block that couldn’t be explained by visiting your typical writing sites, blogs, self-help books? Did your anti-depressants even fail to address the problem? Still making the damn shirt…but I’m at least working on it: Yoga, running (4-5 miles a day right now) and better nutrition are all a start for me. Did I know all of this before hand? Yup. Apparently there is no connection between knowledge and understanding. I’m feeding my brain by watching what I eat. Whole grains, fruits, veggies, lower sugar, green tea and lean meats….duh. I feel more motivated already. Speaking of health, check the blogroll and you’ll find a new blog (well, not NEW, but new to The Asylum) Eating Bender.com. Go check it out for tons of healthy eating tips and general wellness know-how. I thought I’d just gloss over it and wound up spending a good hour searching through her posts. It was inspiring! And honestly, makes me feel a little less alone in this fitness journey of mine.